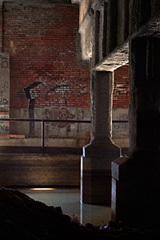 Our first exhibit of 2011 is Focus, our fourth juried theme show. We have heard comments that it is our "best show yet" and we broke all records for attendance at our opening receptions last Friday and Saturday. With more than 100 photographers exhibiting, the show has a wonderfully wide range of subjects and styles. Many mentioned that they were certainly going to return after the receptions to enjoy the photographs again. Chairman of the Focus show, Gil Maker, led the effort to produce the show and all of the Gallery Partners have pitched in to bring together the many facets and logistics of the production of Focus. We are joined by Jim Patton and David Perlman who have exhibits in the East Gallery. While most of the participating photographers in Focus are from the Rochester Region, there is also work selected by artists from Ontario, Canada, Peabody, MA, Poughkeepsie, Elmira, and Ithaca. We are pleased again this year to have Hahn Photographic, a local photography retailer, as an underwriter for the exhibit. Thank you Bruce! For full details of the show as well as a full listing of the photographers in Focus click here. There is no admission fee to visit Image City. We hope to see you during the show and that you find a special photograph to purchase for yourself or for a gift. For the past three years, we have enjoyed the involvement of Peter Marr who has selected "Peter's Picks" from each of the exhibits -- it is a popular feature at the Gallery. For each show, Peter writes a review on select photographs by our Guest Photographers. It was another daunting task to make selections from the more than 150 photographs in the show, but Peter has taken the challenge and has selected eight photographs from the Focus Show. We have excerpts from his discussion here in the newsletter. You will want to go to the webpage link to see larger images and Peter's full write-up, or, certainly better, be sure to visit the gallery to see them in person. "In admiring this wonderfully delicate portrait, which has a poignancy and intensity that is very moving, I am reminded of a statement from Walker Evans, namely, 'Whether he is an artist or not, the photographer is a joyous sensualist, for the simple reason that the eye traffics in feelings, not in thoughts.' We are aware of a very contemplative young lady softly captured by Lauren in an almost high key fashion, except for her dark hair. Her eyes are closed as she gently supports herself. There is a dreamy and romantic mood, but also there is a heightened awareness which leads to drama and atmosphere......"
Peter observed with his choice of Pool of Light by Timothy J. Fuss that "This is an outstanding, powerful image that reminds me of what Jennifer Barton once said, namely, 'The art of photography is to make that which seems unbeautiful, beautiful.' Certainly we are looking at massive vertical support structures, surrounded by many decaying elements such as an aging brick wall, wanton graffiti and infiltrated, sullied water. Furthermore, the foreground has an ill-defined ragged element, that gives the impression we are looking through a jagged fissure in a rock pile. The reddish bricks in the background certainly give a welcomed color relief to the starkness of the other components, but why would I think this is a beautiful image? The answer is the presence of a shaft of light which caresses the important vertical columns, illuminating lovely detail, texture and contrast, culminating in a small reflected pool of light in the murky water......."
In selecting Nancy Guzauski's photograph Flying In, Peter noted that "Nancy, like many photographers, carries within herself a sense of wonder, for without it, she would not produce the outstanding work that she does, images which I greatly admire. Her prints invoke powerful feelings, and trigger something very profound within the observer. In Flying In, we can delightfully explore the one element that is absent in most photographs, namely, time. In this inventive and evocative print, we experience the starkness and decay of past years, and then move through a portal into a world of bright scenic splendor. To add to the intrigue, we are very much aware of two flying birds, whose presence may well be mystifying to many. Personally, I would like to think that we are viewing a time warp, where the birds are messengers that allow us to travel between the past and the future, allowing us brief stops to contemplate on what has gone before, and what lies ahead. ....."
In Philip Lange's Morning Dry, Peter commented that "This is an exhilarating blaze of sumptuous colors, dynamic shapes and intersecting lines, that is a sheer delight to marvel at and to explore every facet of this impressive print. We certainly know that the people who live here, celebrate their happiness and emotions with joyously varied colors, with a stunning example of analogous and harmonic hues, all of which express movement, energy and a definite sense of unity. 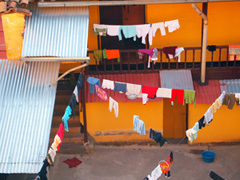 It is fascinating to see that the warm red and orange colors of the walls, doors and the balcony stairs, are often reflected in the hues of the articles of clothing drying in the courtyard. Our eyes are constantly drawn to the intriguing display of intersecting clotheslines, which support an imaginative range of apparel, artfully hung, to maximize their drying potential. The geometric lines form interesting spatial relationships, which contrast strikingly with the many strong verticals and diagonals of the buildings and metal roof structures....... "
With Steve Malloy Desormeaux's West Meadow Sunset, Peter observed that the photograph was "Wonderfully seen and superbly photographed and printed, Steve has captured this serene and idyllic landscape for all of us to enjoy and admire. The sun, that has just disappeared over the horizon, has resulted in a setting that is bathed in magical diffuse lighting, that has enough directionality and reflectance to delineate every line, shape, texture and color, in the rocks, sand and the majestic small group of trees. Every rock exudes power and responsibility in this location, and one can only marvel at how nature has enabled these lovely trees to thrive in a less than fertile environment, and display such an imposing stature. This outstanding panorama is strikingly complemented by an impressive sky in which delicate clouds form a lovely tracery that augments the entire image so well. 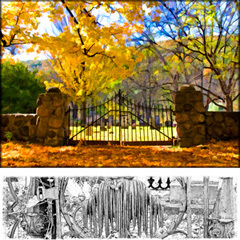 ..... "
With his selection of Autumn Cemetery by Nancy Richards, Peter observed "This is a unique, revealing and compelling print that incorporates a gorgeous, highly colorful image of the entrance to a cemetery, supported in the bottom quarter of the picture by an individual B/W depiction of details, which are probably from the same cemetery..... My interpretation, is that we are looking at the wonder and beauty of life as depicted by the spectacular colored image, whilst being painfully aware of the dark and somber side of 'life' below the ground, as evidenced by the stark outlines in the B/W print. Together, these images combine to give us an incredible final print, superbly conceived, photographed and printed." In Ed Welch's Mystical photograph Peter described "a truly impressive landscape that exquisitely details nature's awesome power and beauty. The autumnal setting gives an especial grandeur with a muted color vibrancy that complements the entire panorama........ Here, these saplings have over time, produced a strong, contorted root system, maximizing every available foothold to sustain life as long as possible. The author has compellingly captured the relentless force of nature in relation to the land, to give us an outstanding, breathtaking vista, one that is superbly seen and captured for all to marvel at and enjoy." For Justyn Sweany Wolf's Chay--My Healing Journey Peter finds "The idea of such a collage is not necessarily unique, but I think that the final result is so powerful and dramatic, that I had to include it as one of my 'picks' for this show. We cannot personally know what each of the individual icons mean or represent, but that level of detail is not important, for we understand that they represent pinnacles or troughs in a tortured journey of pain and sorrow. Thankfully, this was a quest in which there was always love, caring and endless longing and desire for a favorable outcome. This hope culminates in the sun's rays bursting through a dark and dramatic sky, and from which an outstretched white bird of peace and love is seen emerging. Artistically, the river of life is beautifully captured, one that contains countless small stones that clearly represent setbacks along the way. As the stream flows into the distance it narrows, and the stones are more infrequent. 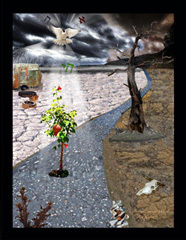 The icons strewn along the way possibly remind us of Salvador Dali paintings, although the significance is not the same." Isn't this a wonderful selection of photographs! Be sure to go to the webpage with the full write-ups for additional comments by Peter for each of the eight selected photographs. Each month, we have had a good turnout for Image City Critiques, our free program at the Gallery to provide participants an opportunity to engage in a friendly, constructive, and positive critique and review of their photographs. The sessions are held on the first Wednesday of the month. Join us for the next on Wednesday, February 2nd from 7:00-9:00 pm. Please bring 2 or 3 jpg images or prints. Images may be on a CD or on a thumb drive and should be sized at most 1MB in size and at most 1500 pixels on the longest side. If you have any questions please contact Don Menges (dmenges@rochester.rr.com) or Gil Maker (gmaker@mac.com). We look forward to meeting with you on Wednesday, January 5 at 7pm. 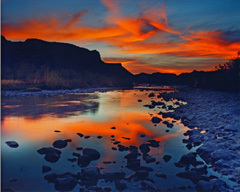 Phyllis and I were photographing along the Rio Grande River in the Big Bend State Park of Texas one April evening in anticipation of a beautiful sunset. The clouds were magnificent and we eagerly awaited what promised to be a gorgeous sunset. I was so confident that I set up two tripods. I placed my 35 mm camera on one and my medium format Pentax 6x7 camera on the other. With my 35 mm camera I used aperture priority exposure and with my Pentax camera I exposed manually. In both cases I used a small aperture to maximize depth of field. Initially, when the sun first dropped below the background mountains the sky became surprisingly and disappointingly dull. Eventually warm colors began to present themselves. The sky then gradually evolved into one of the richest red sunsets that I have ever witnessed. Throughout this transition the colors seemed to become richer and brighter. My aperture priority meter readings with my 35 mm camera of course adjusted accordingly. I suddenly realized that I needed to start monitoring my manual meter readings with the Pentax camera more carefully. I quickly adjusted my exposures with the Pentax camera. To my surprise, the sky became increasingly brighter after the sun had set. In fact, after the sun had receded below the horizon, the sky continued to brighten by a solid half stop of exposure. After awhile the sunset took on a normal pattern of gradually diminishing brightness. This is the only time that I have ever experienced an actual brightening of the sky after the sun had slid below the horizon. Often the sky will become more colorful but I had not expected the light to become brighter after the sun had set. The lesson learned is that when using manual metering it is important to monitor exposures carefully and often, even when the intensity of light might not seem to be changing. I titled the photograph Contabando Sunset. This is a new column that will run in our monthly newsletter. As the title states it is my own "musing" on photography. It will be about theory, philosophy, and other thoughts that come to mind as I sit in front of my computer. I am not a professional photographer. I do not make a living with my camera. I am self-taught. I have improved over the years with trial and error. I am not an amateur photographer either. 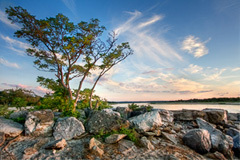 I have sold a few images since I became a member of the gallery. Does that make me a professional photographer? I don't think so. Why the pickiness between these two words? If you sell an image you are now a professional, but if you don't you are an amateur. This sells both categories short. To be a professional photographer takes on a life of it own. Years of schooling, maybe working for another professional photographer at low pay, learning to run a business, all the time continuing to improve your craft until you can make a living. Being a professional photographer is considered, by some job polls to be one of the most stressful jobs to have. And the amateur? One definition of the word is unskilled. I do not think that I am an unskilled photographer. And in viewing the portfolios that are presented at the gallery I know that there are plenty of skilled photographers who do not make a living at this craft. Here is my main point. The word amateur comes from the Latin word amatorem, which means lover. All photographers, professional or not, share a love for this craft. We work at our craft, wrestle with problems and try to figure out solutions. We go out in the worst kind of weather to get a shot. We will wait for hours at one spot for the light to be just right for us to snap the shutter. Being a professional photographer is a very lofty goal. The ones that go this route should be proud of their success. The "amateur" photographer though is no less skilled or dedicated to creating great images. The word, amateur, though makes me feel less competent than I am. The word makes me feel uncomfortable. We need a new word for the rest of us. Any ideas? 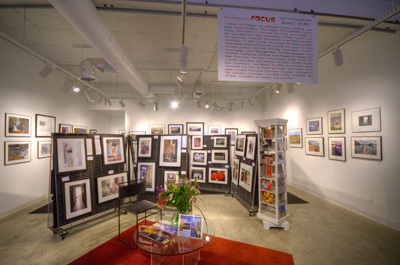 During the Focus Show, all gallery exhibit space is devoted to the photographers who entered the juried show. Gallery partners are exhibiting their work on the high-resolution video display for this show. Be sure to check it out. The display panel with the video display is available for rental by photographers for their own exhibit during our shows. We have a special rate for student photographers who exhibit their work on the panel with the video display. Check with a Gallery Partner for details, if you are interested. The event, titled 60/20 Virtual Tour: Art in Motion is a virtual installation of six decades of innovative and diverse work by Arena Art Group members, multi-projected on the walls of Rochester Contemporary, 137 East Avenue, Rochester. Two nights only Thursday, January 13 from 6 - 9 pm and Friday, January 14 from 6 - 10 pm. 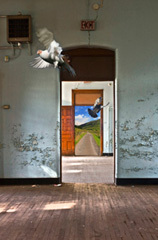 Gallery Partners Betsy Philips and Dan Neuberger are long-time members as well as other photographers who have exhibited in the past at Image City. Check it out.